Your website visitors are just as diverse as the community you serve. To deny them access to the content on your webpage is the same as not providing them access to your physical location. When the Americans with Disabilities Act (ADA) was first put forward the internet was just becoming mainstream. Now protections for those with disabilities are being enforced across the digital landscape. This new focus on the digital experience comes with quite a bit of confusion. Courts have stated that even without comprehensive legal standards you are open to being sued and found liable if your website is not ADA compliant. But not to worry. There are some basic design standards that you can follow to reduce your risk and make sure your site is inclusive to all users. ALT tags are what a user is shown in place of a picture. Pictures are worth 1,000 words, as they say, but not to someone who is blind or has a vision impairment. Users such as this use screen reading software to help them navigate the pages more easily. ALT tags help in this process by providing a brief description of what a picture is. This is the first step in making sure your site is ADA compliant, which will also increase your site’s Search Engine Optimization (SEO). The majority of the recent ADA website lawsuits are focused on website forms, such as PDFs. Making PDFs accessible not only makes it easier for those with disabilities to access them but also makes the PDFs easier to use for your average user. Having forms and services available online will also cut costs, saving you time and money in the long run. Many sites have started to include audio clips and video announcements and walkthroughs, which is a great way to gain attention. However, this can leave those with hearing and visual disabilities behind. To prevent these users from being left out, add closed-captions to your videos. Even though the user may not be able to see or hear the video, they can still access the information just as easily as your other users. There is also a growing trend of watching videos with the sound off, which is another reason to provide closed captions with your videos. The majority of users today are coming to your site from some sort of mobile device. Making sure your site is mobile-friendly should be a requirement today. If your site is not optimized for mobile you are doing a disservice to over half of your visitors, not just those with disabilities. These are just a few of the basic guidelines your website should follow to provide the best overall user experience to everyone. Remember, utilizing inclusive design tactics will not only make your site more accessible to your elderly and disabled users, but also your entire user base. As websites evolve, so do these guidelines. Just as a website from 2010 will not serve users with the experience they expect in 2019, so will become today’s websites in the near future. 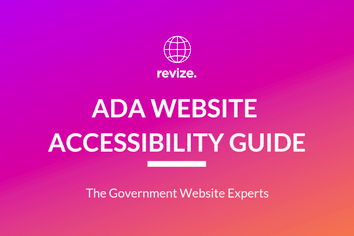 Until there are predefined legal standards, it is always best to consult with a web provider who is well versed in ADA website compliance, accessibility and inclusive design. Author: Scott is a United States Army veteran and Marketing Specialist. After serving in the military, Scott went on to study business in San Francisco. After college, Scott worked in Silicon Valley in the technology industry conducting marketing, advertising, and business development. Currently, Scott works for Revize: The Government Website Experts as their Marketing Specialist.